Water heaters are one of the costliest components of your home plumbing system so when something goes wrong, it can cause stress and headaches. Luckily, most water heater problems are very easy to fix yourself. For complex problems, be sure to contact your Baltimore plumber about water heater repairs. For simple problems, though, read through today’s blog and you may just learn a tip or two that comes in handy someday! Most common water heater problems can be fixed easily. Water heaters are quite simple, technically speaking. They consist of a tank where water is stored, a cold water intake, hot water outlet, and drain valve. An assortment of other components are found inside the tank including a heating element, a rod that helps prevent tank corrosion, and a dip tube which directs cold water to the bottom of the tank so that hot water is made available first. Before attempting any repairs, your water heater must first be drained. To do this, turn off the heater at the gas supply or electrical panel and allow it some time to cool. Then, shut off the cold water intake and secure a hose to the drain valve. Opening a hot water tap in your home is a crucial next step as it allows air to flow into the tank during the draining process. Allow the water to drain either outside or into buckets but use caution as the water could still be very hot. Many common water heater problems can be cured by simply flushing the tank so it is the best place to start if you have noticed a funny smell coming from your hot water or do not have enough hot water. To flush the tank, drain it first and then close the drain and open the intake valve. Fill the tank halfway, then turn off your cold water and open the drain. This will allow any accumulated sediment to be drained from the tank. You’ll probably need to repeat the process a few times before the water coming from the tank runs clear. 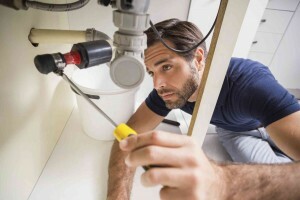 If this process did not fix your problem then it’s time to bring in the expertise of a professional Baltimore plumber. This entry was posted on Thursday, December 3rd, 2015 at 5:45 pm. Both comments and pings are currently closed.